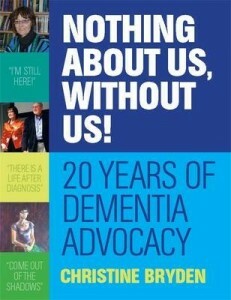 The unusually slow progress of her condition puts Christine in a unique position to describe the lived experience of dementia, a condition 1800 Australians are diagnosed with each week. She shares what it’s like to start grasping for words that used to come easily. To suddenly realise you don’t remember how to drive. To be exhausted simply from the effort of trying to appear ‘normal’. 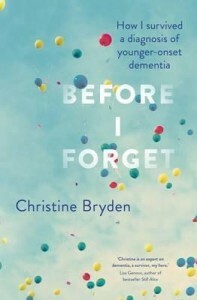 In this inspiring memoir, Christine looks back on her life in an effort to understand how her brain – once her greatest asset, now her greatest challenge – works now. She takes us through being a gifted child and then a troubled adolescent, examines how she survived a destructive marriage while enjoying a high-flying career, and shares the steps she takes to maximise her brain function. 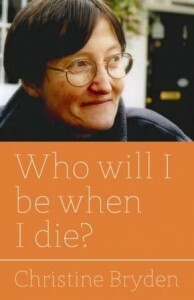 This is Christine’s legacy for people with dementia and those who care about them. 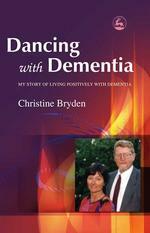 Before I Forget: How I Survived a Diagnosis of Younger-Onset Dementia. 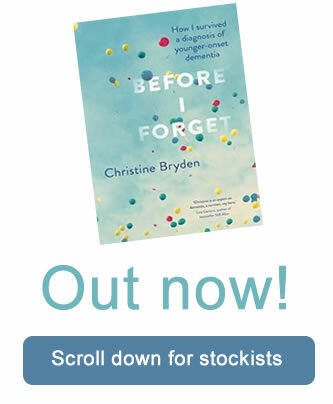 Christine Bryden, Penguin Books Australia, 2015, ISBN 9780670078745.